Fettuccine Alfredo: Fettuccine Alfredo is a pasta dish made from fettuccine pasta tossed with Parmigiano-Reggiano cheese and butter. As the cheese melts, it emulsifies the liquids to form a smooth and rich coating on the pasta. It was named by a Roman restaurateur, Alfredo Di Lelio. Note: For this dish dry fettuccine noodles are used. If you are using fresh fettuccine noodles, adjust timing accordingly. Melt the butter in a large sauté pan set over low heat. Add the cream to the butter as it melts. Stir often to combine the two, do not turn off the heat, but keep the heat at its lowest setting. Lift the al-dente fettuccine pasta out of the pot with tongs. Move the pasta to the sauté pan. Do not drain the pasta. You want it dripping wet with the cooking water. Turn on the heat under the sauté pan to medium. Swirl the pasta and butter together to combine. Add half the cheese, then swirl and toss the pasta until it has incorporated into the sauce. If needed, add a few spoonfuls more of the pasta cooking water. Add the rest of the cheese and repeat. Fettuccine Alfredo is ready to be served. 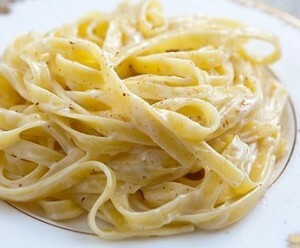 Season the fettuccine alfredo pasta with black pepper. Add powderednutmeg over the pasta.